Basket Blasters - New England Silica, Inc.
Pro-Finish® basket blasters automate cleaning, peening, and finishing of small work pieces. With certain types of parts, no other finishing method can compare to these heavy-duty production machines in terms of speed and quality results. Empire’s BB2 and BB4 Basket Blasters automate cleaning, peening and finishing of small workpieces. With certain types of parts, no other finishing method can compare to these heavy-duty production machines in terms of speed and quality results. Operation is simple: Load parts into the unit, set the precision timer, and the Basket Blaster does the rest. 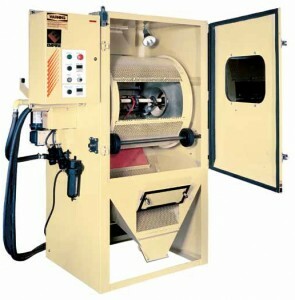 By tumbling parts within abrasive blast streams, these machines deliver consistent finishes – automatically. 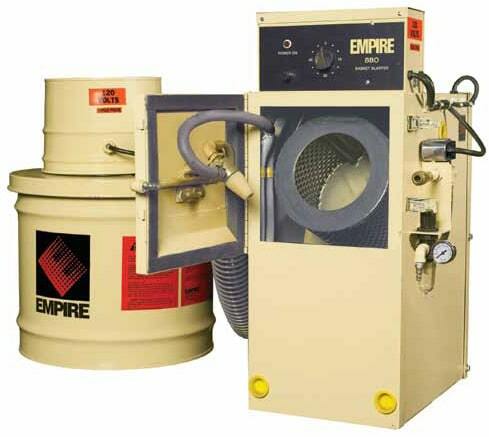 Empire’s heavy-duty Basket Blasters feature an unloading chute to speed parts handling and a polyurethane-lined media reclaimer supported by rugged ductwork to reduce maintenance requirements. Two models are available: a BB4-3K with a 350-pound parts capacity and three pneumatically controlled oscillating blast nozzles that increase production rates while reducing power consumption, and a smaller BB2-3K unit with two fixed nozzles and a capacity of 300 pounds. Put either unit to work and your parts finishing costs should start to take a tumble right away. If you’re looking for a fast, efficient, economical method for finishing small parts, check out one of Empire’s BBO Basket Blasters. To finish parts, you simply drop them into the BBO’s nine-inch by nine-inch basket, set the time, and let these table-top work savers do the rest. As parts rotate through an abrasive blast stream, they are cleaned, peened or finished evenly and automatically. 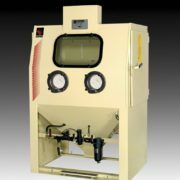 By varying air pressure and abrasive media, you control the type of finish as well as required processing times. Beyond freeing you from the tedious chore of processing parts manually, Empire’s BBO Basket Blasters save you time and money in other ways. They are inexpensive, come fully assembled and ready to operate, require only a two-horsepower compressor, use less electricity than a 150-watt light bulb, and meet OSHA requirements. 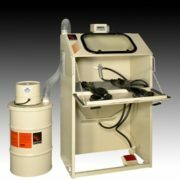 BBO Basket Blasters come in two OSHA compliant models: a BBO-1 with dust bag, and a BBO-2 with a cartridge dust collection system that provides cleaner, more efficient operation. 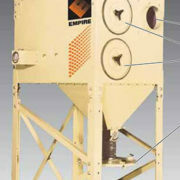 Both Basket Blasters are recommended for applications where blasting is performed two to three hours per day.